WBC Champion Deontay Wilder has claimed that Anthony Joshua's team are "begging" for a world heavyweight unification bout. 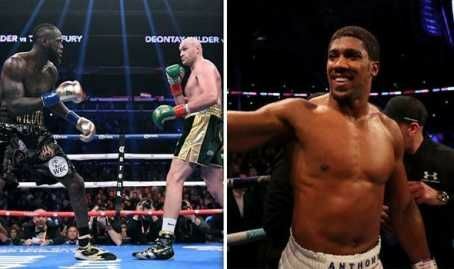 33-year-old, Wilder controversially drew against Tyson Fury earlier this month in Los Angeles. MySportDab report the WBC have now sanctioned a rematch after a "unanimous agreement" in a meeting of the board of governors. However, Speaking on Joe Pogan's podcast, Wilder said: "They're definitely begging now. He's trying to reach out all of a sudden. "His management have been trying to reach out to mine as well," he added about the possibility of a heavyweight unification fight, in which all four (IBF, WBO, WBA and WBC) titles are up for grabs. "He could have had this opportunity, he had many opportunities; he could have fought Luis Ortiz, he could have fought me, he had a chance to fight [Tyson] Fury. "But people want to know who's the best, especially after seeing this Furyfight, and I've been trying to show people who is the best. I'm always going to say I'm the best until I'm defeated."